In India’s corporate scene the April fool corporate prank is slowly becoming a tradition. Inspired initially by Google’s legendary April Fools’ antics, Indian companies have been intricately designing pranks to fool customers, encourage humour and ultimately engage audience. Well, who knew April Fool Pranks could be so creative! 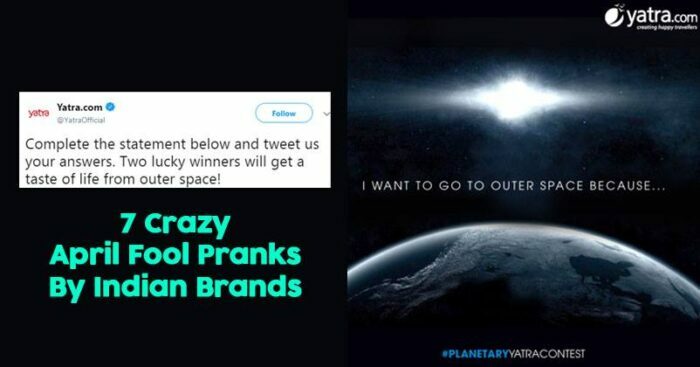 The online travel company has launched a contest prior to April fool’s day asking the fans to complete the statement- “I want to go to outer space because…” The two winners who must have technically expected an actual trip to space had to settle with an Interstellar DVD. What a trick! The e-commerce brand has charged up for the day, starting from interesting prank on its site to giving tips to fans on how to make use of the day. Products like Silicon Moustache Stylers to Dream Decoders and Exotic Pets from Madagascar, the Amazon Edge Collection had it all for the day. Little did the people know that none of these were real until it was unfolded in the last few seconds on the video where the whole day they jogged their brains regarding the ‘at-all’ usage of the products. Zomato apparently was supposed to launch an app called Zomatocho, for singles to help them find someone special who will share similar interests and preferences in food. It uses a proprietary algorithm that takes into account your known dining behaviour based on the way you use Zomato, including a couple of other parameters. So, basically, the app takes advantage of the people’s intense love for food and intelligently involves the ‘singles’ in the background. So slow claps for all the foodies who believed this! Ola and Uber both are active competitors both on the street and on their social media platform. The masterstroke of Uber combining Promotion and humour into one was bang on. Like the popular rewards of Uber, the app popped up with a similar notification with a promo code. But well, when the amount is as high as Rs 999, it would not be that easy! 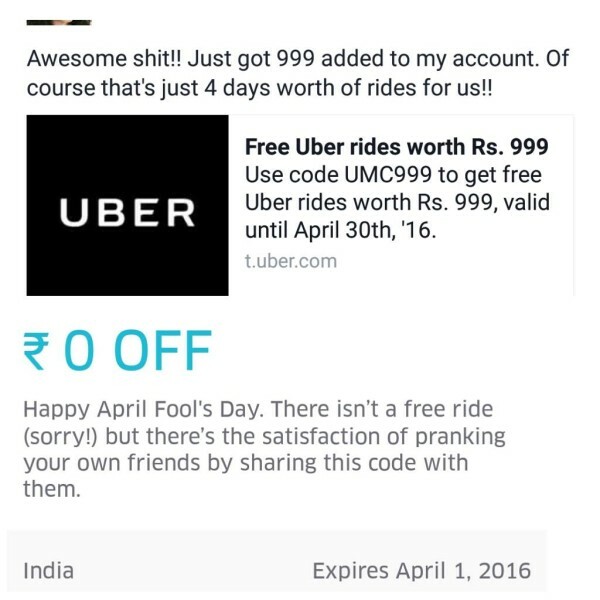 And yes, It was a Happy April Fool’s for the Uber Users! The e-commerce companies providing discounts are cracked down by the Indian government, but Paytm came up with an offer to combat all offers- a 100 percent cashback on an iPhone. This was definitely ‘too good to be true’ situation. This again tapped the basic psyche of the people to grab anything ‘free’, only to find the real ‘fool’ recipe at the end. Kudos to all these famous names, that actively merges all the precious occasions and notable days into the marketing and social media mix. Since it is difficult to predict the startup world, it is interesting to observe new competitors participating in this field.